“Happy St. Patrick’s Day!” says she who forgot to wear green today. My eyes will have to count. We have a fun tradition in our school (it’s probably in other schools, too) where a sneaky leprechaun visits the classroom while the students are at lunch or recess and causes havoc in the class. Pranks include messing up the teachers and students desks, leaving a little green leprechaun pee in the toilets, bedecking the classroom with green streamers and shamrocks, making tiny green footprints across the classroom charts, leaving treats for the students, and writing teeny tiny notes on the white board. The students LOVE the fun and you can hear them squealing down the hall as they return to their classrooms. No one squealed here tonight for my St. Patrick’s Day dinner but I squealed on the inside because it was vegetarian, low fat, and very tasty. 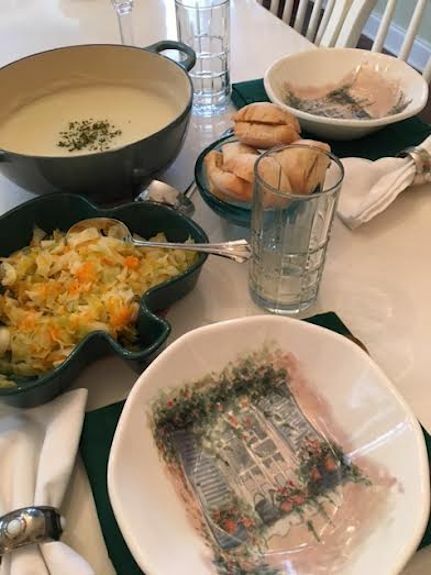 I made cream of potato soup, steamed cabbage and carrots, and served it with ciabatta bread. 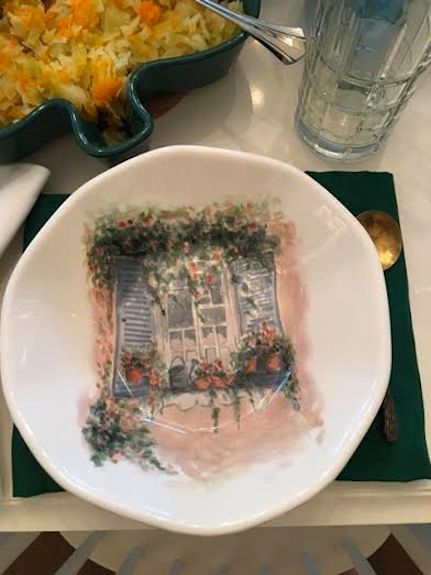 I like the new bowls I found at Home Goods when I was in Athens. Is there anyone who wouldn’t like to have a sweet cottage somewhere with a pretty window box full of flowers? Not to be left out, I did a little pranking of my own with dessert. I made some Leprechaun Poop! Why should the students have all the fun? 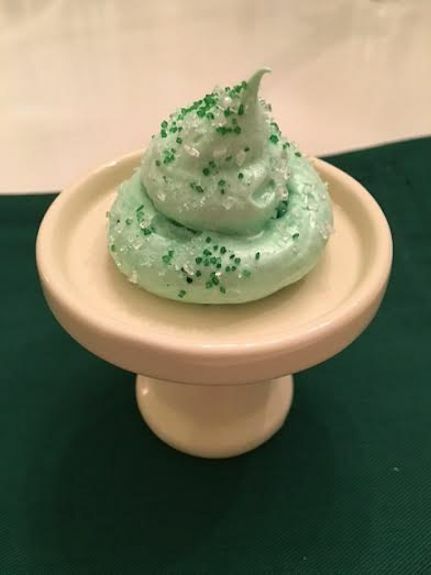 In case a Leprechaun didn’t visit your house and leave a little pile of poop for you, I’m including a recipe that just might be a good substitution. Add the cream of tartar to the egg whites and beat until soft peaks form. Slowly add the sugar one tablespoon at a time until all the sugar has been added. Continue beating until the mixture is stiff and glossy. Add vanilla and food coloring until well blended. Pipe onto parchment paper into piles of “poop.” Sprinkle with colored sugar, if desired. Bake at 200 degrees for 1 1/2 hours. Remove from oven and transfer meringues to a wire rack to cool. Store in an airtight container.